I found the core book for Tales From the Loop to be a refreshing surprise, and things have only gotten better from there. Just recently the series got picked up for a television program, which will boost its visibility substantially and hopefully get some more people interested in gaming. Our Friends the Machines and Other Stories is the first supplement to the game, providing you with more premade adventures to run in the dark 80s world being warped by the Loop. While it has little to offer other than a few story elements, those plotlines manage to be true to their inspirations while proving unique and thought-provoking all their own, exemplifying some of the best of what you can experience with this game. Our Friends the Machines and Other Stories consists of six sections of adventures, of varying size, to provide you with more content for your game. You will not get any new ways to customize your character or modify the rules, so if you are looking for ways to flesh out the mechanics you will be out of luck. This supplement is story material through and through, for better or worse. As with the adventures in the core book, this is structured specifically to get newer GMs prepared for running their games comfortably. It begins with a long, structured narrative and proceeds to lay out shorter adventures. The penultimate chapter, however, is just a series of small adventure hooks, containing blueprints for machines, explanations of how they work, and a few hooks to let you use them. By the time a GM has run one of the longer adventures, they should have the skills to improvise, riffing off of the small clues provided at the end of the book. Along the way, the various mysteries delve into many issues key to the 80s, like the Satanic Panic and the budding conception of artificial intelligence. Our Friends the Machines, the main adventure, has a fascinating high scifi concept that manages to hit multiple beats very well. It is at turns thought provoking, terrifying, and heartwarming, bringing some of the best out of a “children’s fear taken seriously” type of narrative. I won’t spoil it here, but suffice it to say I found the opening paragraphs explaining the stuff to be the seed of a story your players are sure to remember. The narrative is somewhat simple, consisting of a few locations where clues will be uncovered and story beats experienced, but allow for a great deal of room in how players approach them. Organization and presentation continue to be a strong suit of Free League Publishing. Each adventure uses a somewhat simple narrative, consisting of a few locations where clues will be uncovered and story beats experienced, but allow for a great deal of room in how players approach them. Those locations are laid out in a clear format for the GM, not only as a visible map but with some simple paragraphs to give you options about how and when to present material. It’s as true here as it was with the core book: this is a great resource for new GMs who want some help getting over arcane issues such as narrative structure in an RPG. The adventures in this book also grant your players multiple options as to how they want to conquer the main challenge. These options require not only different skillsets to accomplish, but outlooks. Between two unsavory groups, who do you help? Do you take the easy, safe way out of a situation to resolve it for good, or try to form a more tenuous peace by taking a higher risk? Giving players additional options is a small thing, but one that often goes overlooked. The book’s moment to moment organization is exceptional, but overall it leaves some questions hanging. Chapter one is two pages with short synopses of what each other chapter contains, which to anyone else would be a table of contents. Chapter seven, the final portion of the book, is about making your own town to set adventures in. This chapter is nearly useless, unfortunately. It contains only the most generalized information and goes on for a scant few pages, using advice that seems obvious even for new players. I am more inclined to believe this chapter structure is a misstep than a cynical way to make the book seem as if it has more content by filling it with additional “chapters” but it does mean that there is slightly less here than might appear. It’s especially a shame because of how much potential Tales From the Loop has as a sandbox experience. As good as the main adventure is, Horror Movie Mayhem is the real gem of this supplement. It tackles the infectious conformity of moral panics, and the fact that your best tool against them is to engage with media and ideas that make you uncomfortable. This is a fantastic usage of the setting and science fiction in general, and helps cement Tales From the Loop as a worthwhile game. While taking on some attributes from older media (does anyone else remember The Faculty, featuring a pre-success Jon Stewart in a minor role?) it reinterprets them through the lens of the 80s, asking what problems were most on the mind of youths at the time. The last main adventure, involving a Mummy and some otherworldly entities mixes in Hammer Horror films with Steven Spielberg, and I am fully aware of what a contradictory set of influences that appears to be. The twists and turns have the potential to leave the players genuinely frightened, and contains one of the more difficult final act choices (provided that you play up some of the more disturbing implications in the narrative). Chapter five is full of smaller, more limited adventures that you can use to sprinkle into your setting, or run for single session adventures. These are easy to drop into your town and help show the creativity of Free League’s team. Their diversity is surprising, and lend themselves well to many points in a campaign. One of the best aspects of these small adventures is the Countdown: ways to escalate the conflict as the adventure goes on, ensuring the players get invested and feel that time is running out. It also helps to structure the adventure as a whole, informing you of the most important developments throughout its runtime. Chapter six contains a few machines, replete with blueprints and functions, that could easily be part of a larger story or the inspiration for their own mysteries. These pages are bite sized chunks that ooze quality, using the smallest amount of space for substantial inspiration. The art remains every bit as subtle, inspiring, and enchanting as ever. 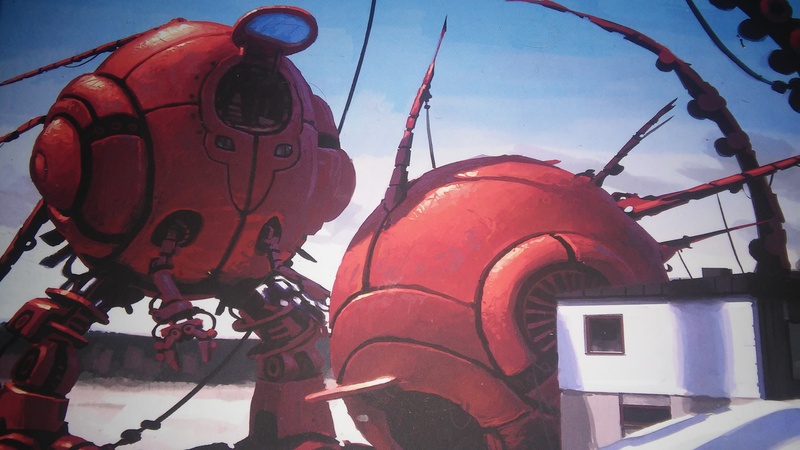 It is no wonder that Amazon would choose to put these pieces in motion, and I hope they capture the same contemplative essence that Simon Stalenhag puts into all of his work. In a way, there is both a lot and a little to this book. It doesn’t really add to the “lore” or character options of the game, but Tales From the Loop never had to rely on either to succeed. Our Friends the Machines and Other Stories packs a lot of punch with unassuming presentation, and helps make a great case for the main game. While the main issue remains that Tales From the Loop is not the best for long stories, the support provided here will keep you wanting to come back. Our Friends the Machines has stories that range in length, complexity, and tone, but all for the betterment of an already exceptional experience. Evoking some of the best of 80s media with its own spin, this book is a great resource for GMs looking for inspiration.